The easiest way to switch your effect On and Off is to use a mechanical switch. Usually a 2PDT (two pole double throw) switch is sufficient to do the job but usually a 3PDT (three pole double throw) switch is used to allow switching the LED indicator directly as well. In the schematic above you see SW1A and SW1B which make up the 2PDT switch. 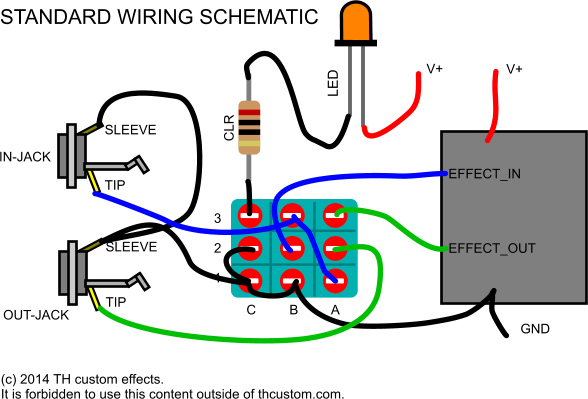 SW1C is only existent in 3PDT switches to switch the LED to GND. 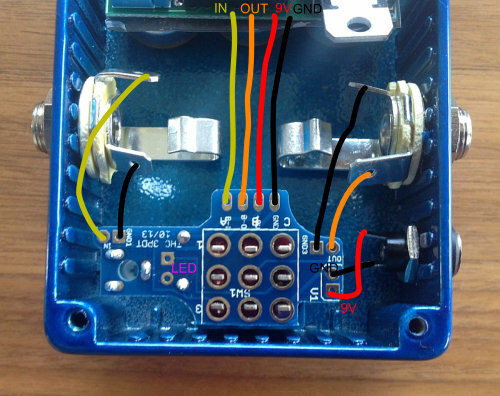 In the True-Bypass state of the switch the Input signal from the Input-Jack (JACK_IN) is directly connected to the Output-Jack (JACK_OUT) via SW1A. The effect itself is completely out of the circuit. At the same time the effect input (TO_EFFECT) is grounded via SW1B to prevent the effect from oscillation or any other unwanted noise when switching it on. SW1A connects the effects output (FROM_EFFECT) to the Out-Jack (JACK_OUT). At the same time the input signal (JACK_IN) is fed to the effect (TO_EFFECT) via SW1B. If a 3PDT is used at this time the LED is grounded via SW1C and it will light up. 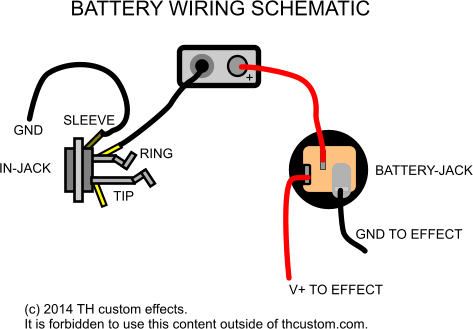 There is some additional wiring if you wish to use a 9V battery in your effect. This secures that your battery in not connected when no jack is in the IN_JACK. It also makes sure to disconnect the battery if a power plug is connected to the power jack. By using PCBs especially designed for this purpose you can make your life as an effect builder more easy. The layout on the PCB already does connect the right pins together and has mounting points for your wires at the right places. They may come with added value like mounting places for your LED, CLR and in some cases a potentiometer to control the LED intensity.